There is a very interesting study done by the automobile club ADAC already in the early 90ies that crossing roads are better managed with a traffic circle (roundabout) and not with a traffic light. I remember that because at this time I was a press speaker for ADAC Gau Rheinland and was deep into this topics. It was very popular in the 80ies to have traffic lights. All had to stop, sometimes for nothing. The cost to maintain the lights, are so high – the roundabout is a onetime investment. But what is more striking: The points of accidents are reduced to 8 with a circle while there are 38 with the traffic light. Article from 2014 . Instead of technical equipment they used a basic rule: the circle has the right to go, the incomes have to wait. The same was done in some cities who banned traffic light (specially in old cities with medieval charge) like Brugge in Begium, it is simply right for left. This rule reduces the traffic speed as you have to stop or go slow for every cross road. 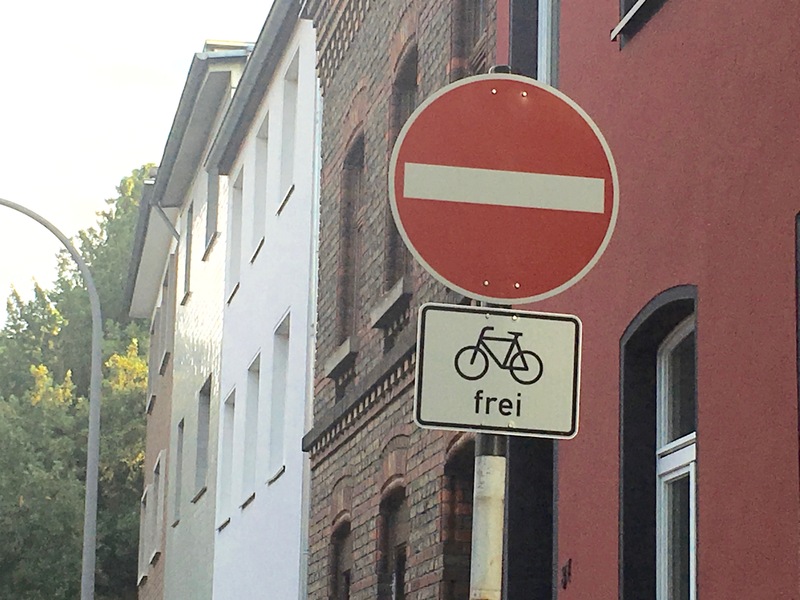 I think this is a very German way to control risk. In the old days there was a believe, that with regulated traffic, which you have with the traffic lights, there are less accidents. But that turned not to be true. Germany like to use technology to protect themselves – we have a very high believe in technology for everything. Other cultures are much more pragmatic, like the British people. 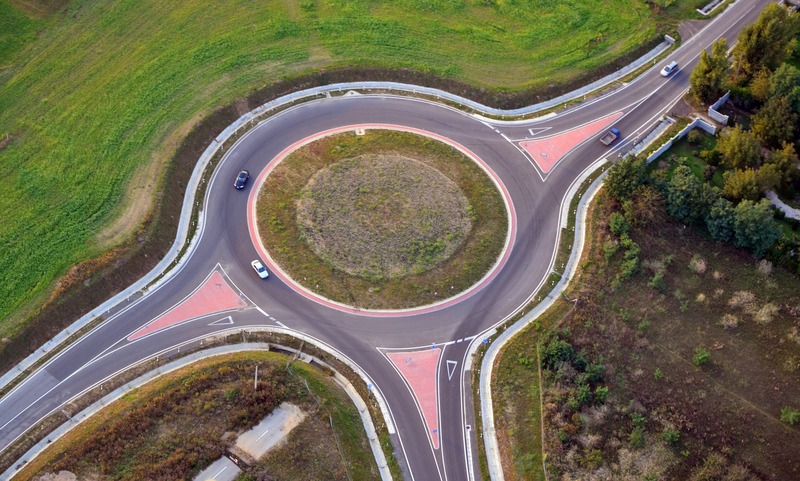 They had roundabouts yours ago … why to make it technical if it goes simple? You know that people who are building roads on a white paper in a community office like to have it straight. All their tools to plan are more or less straight. This is the norm in planning. I love to see the reality, because the roads are built straight according to the plan, but they are not used this way. People like short cuts … by foot or bike – they take the shortest way. Over time you can see it – as there is a new road next to the original paved road. Don´t you see the parallel to the business? We have so many rules and restrictions how to do it – but also here people like shortcuts. And what do we do: We try hard to fight against it. – You can forbid it and take a fine, if people do not take the right way. But we still have no laws for that – it is still a habit and so it is impossible to fine it. – You can ignore it – this is what happens most of the time – from both sides. – You can learn from it and build roads the way, they will be used by people later so they have a paved road with a short cut from the beginning. Why do I talk so much about this behaviour: First of all there was a learning already and many parks are designed organic – without straight ways – as this is what people like. And there is another learning in it: You cannot plan against human nature. If people will like to make shortcuts, they will do it. So the same happens in the organisations and we have rules and procedures nobody takes care off. Why do we keep them? Why do we allow this to happen? We all talk about smart cities … why not being smart in the office? We want to reduce complexity and bureaucracy? Why not start reworking our rules and procedures to what is needed and workable? To start is to stop doing. 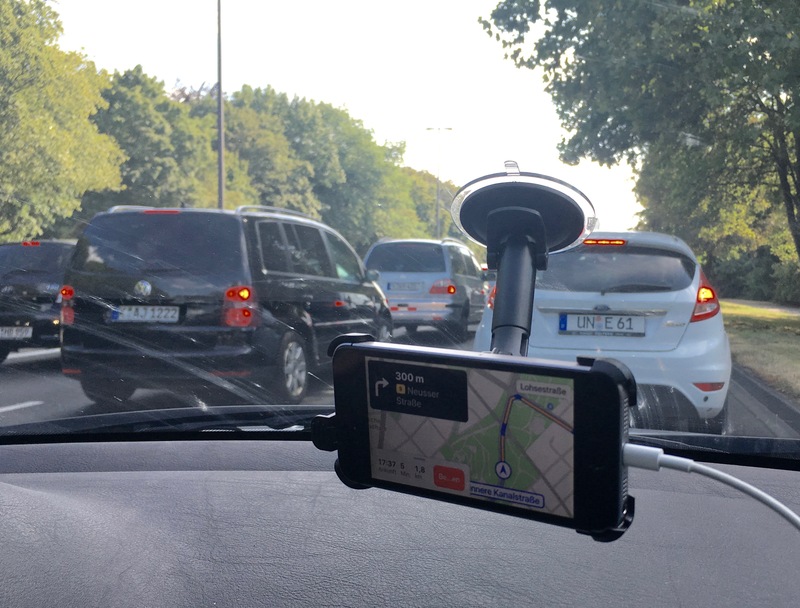 Some of my Learning in Cologne, my hometown: We have narrow roads and that is why we use most of them only in one direction, as the cars parking on both sides take all the space. The city likes to motivate people to go by bike – as this would reduce the space needed in active traffic. So they opened the streets from both sides for bikes – but not for cars. You as a car driver only find out about this new rule, when a biker is in front of you where you do not expect them. Only than you know: I need to take care – here are bikers on both sides and that is ok. The biker has the same problem – as you need to take care for the car coming – as streets are still narrow. If both reduce the speed, both can go along side easily. So one road, has two habits of use. Why not optimise the capacity of roads by changing the rules? I think this „freedom“ for bikers did not come from city planners, but from bikers who just did it. And somebody found out – there are a lot and you cannot give all a fine every day. So why not legalize it? This only happens when there is tension. Law changes come from bringing the tension down. How can w transfer this social behavior into business? Which rare capacities do we have? Perhaps the room- most of companies try to have rooms and desk open for all – not your own room, but share room. Will digitalization and the use of sensors change our systems? In the city of Cologne in Germany most streets-lights are connected and give you a green wave, if you go by 50 Km per hour – so the system tries to get the sped down into a smooth flow. This is fine if there are many cars, but it is not efficient, if the streets are more empty like in early morning. So there are cities that installed sensors at each traffic light and measure the coming cars and bikes before they reach a ground signal. It adapts to the need of the drivers. Some cities try to compete about the smartest way, specially in the Netherlands. 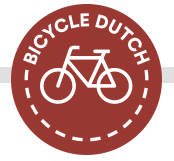 Take this example from Utrecht – a playful station gives a sign for bikers to avoid stopping at red light – more adaptation to match the traffic lights. Another example is s`Hertogenbosch. They try an individual sensor system to give as many people green lights as possible – which in the first place can confuse the pedestrians or others. It takes time to understand how the system works. Most innovative is the traffic light on the ground – for the people who never look up again from their mobile phone. Instead of having external technology to steer people – why not give people the technology to support their decisions? That is what we do in the car every day, when we use the Navi-System, even for roads we know very well – as there might be an unforeseen traffic jam – so we can avoid this right from the start of the journey. But it is still us who drives. We need to bring it to the people.